No one is happier than us that spring has arrived, but the new season does provide a few cooking challenges. After a full winter of kale, we tend to go overboard with spring produce at the farmers market- so we have piles of asparagus, artichokes and fennel to cook every week. We are OK with the asparagus and artichokes, we have plenty of good recipes for those veggies. But what are we supposed to do with all this fennel? 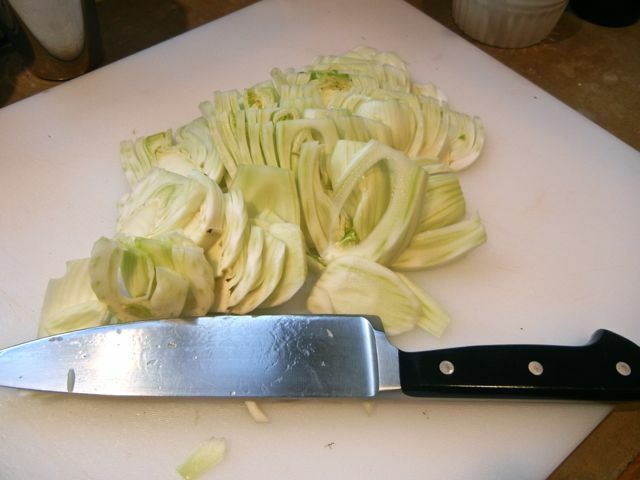 If you don’t cook with fennel, it is a large, layered white bulb with a fluffy green top. It is in season spring and early summer (there is also a fall crop in some regions). Fennel has a crisp texture and tastes like licorice, or “anise”, if you want to be nice. With anise as the lead flavor of fennel, it becomes a challenge to find a compelling use for the stuff. Fennel is tasty shaved on salads or as a minor component in fish stews, but if you go a bit crazy and buy four bulbs, you need a dish that uses it all. And it would be nice if it actually tasted good. Happily, we found a dish that doesn’t just use up the fennel, it really rocks– you will actually want to buy fennel on a regular basis. And it is easy, too. 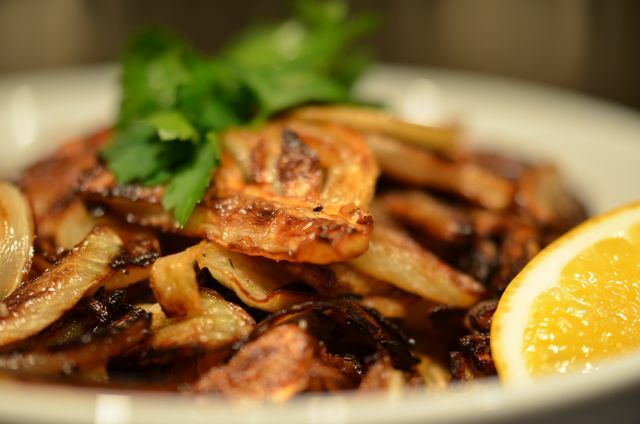 You simply caramelize the fennel. That’s it. Fennel, olive oil, salt, pepper and a squeeze of lemon. A sharp knife, a hot pan and 20 minutes. And you suddenly get a great snack or side dish that features sweet, crispy fennel with just a nice touch of the anise flavor. How did we find this recipe? We went to the experts. We looked at Judy Rodgers’ “Zuni Cafe Cookbook”, “The Victory Garden Cookbook” and Alice Waters’ “Chez Panisse Vegetables” looking for a good fennel recipe. The one conclusion they all shared was that deep-fried fennel (usually part of an Italian “fritti” dish) is super-tasty, sweetens the fennel and softens the anise flavor. But if you are like us, you are not ready to make deep-fried dishes every day. Luckily, Carolyn noticed that Alice Waters did provide a recipe for caramelizing the fennel in a hot skillet with a small amount of oil, so we decided to try it. 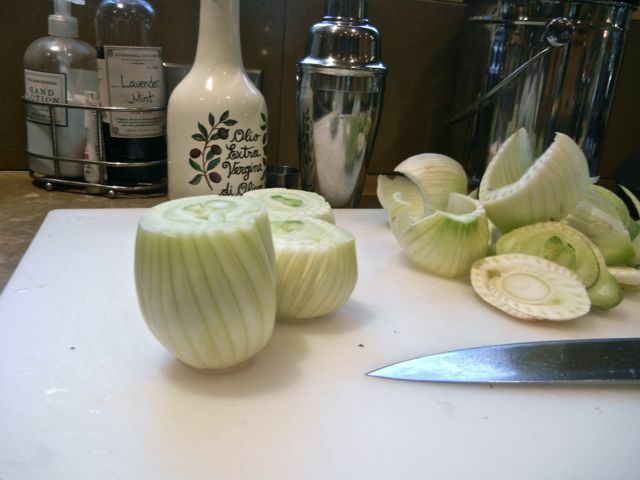 All you do with the fennel is trim the top and bottom from the fennel bulbs, slice it thin (but nothing crazy), and remove the cores. As for cooking, you will need a large skillet, ¼ a cup of good olive oil and medium high heat. You then cook the fennel in the hot oil, making sure to brown the fennel, NOT steam it. When the fennel slices are golden brown, about 10-12 minutes, you are done. Season with salt, pepper and a squeeze of lemon. Serve as a snack or side dish. Life should always be this easy. As for the flavor of the dish, it is slightly sweet with just a pleasant touch of anise flavor. Both Carolyn and I found the flavor and texture reminiscent of fried eggplant, a dish we eat whenever we can. We added the lemon to the recipe and it provides some nice sourness and acidity to play with the suddenly sweet fennel. 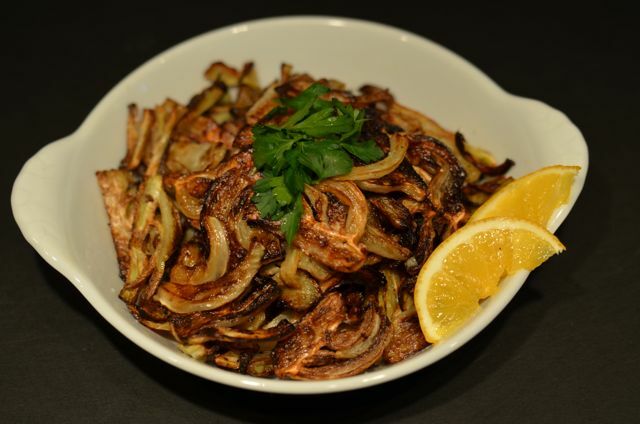 We both love the dish as a snack, but would also serve caramelized fennel as a side dish with fish or chicken. Carolyn thinks it is the best spring vegetable dish we’ve made, I still like the asparagus and rice soup a touch more, but I would be happy to make this fennel dish anytime. I have never made fennel. I am afraid of it. But this might be just the addition to spinach pizza I’ve been looking for! The fennel (at least done this way) is really good and gets pretty sweet- I bet it would be a good fit with spinach. Like me, it seems you see fennel as a glorious vegetable that is enobled by camelization. I make a variation of this dish with the addition of white onion, capers and crushed red pepper cooked covered but with no lemon. I still get the carmelized fennel, but it is softer. Sweet, salty and spicy all in one dish– and never have any leftovers. A great side dish for meat or fish. I like your lemon idea and will add it the next time I make fennel– perhaps for Easter as a side dish. Thanks, I will try your version- it sounds great. Oh, I will. And one more thing, more cocktail recipes please! 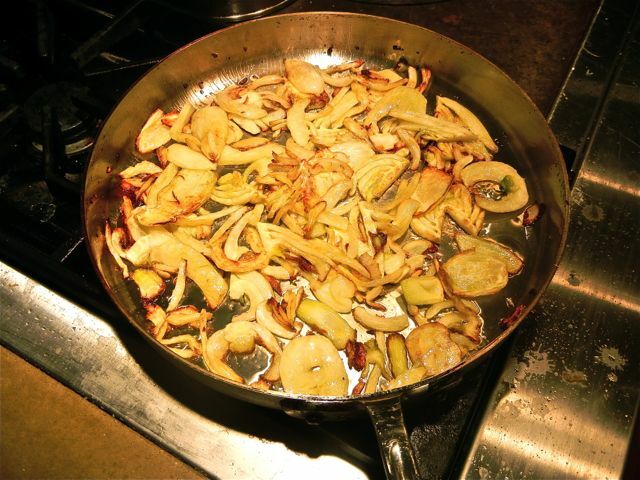 I just made the Caramelized Fennel… I love Fennel and this is great!! My wife, who isn’t as fond of cooked fennel as I am liked it too. I think the capers and red pepper flakes sound wonderful. That is next. On my list. Another great way is to try it roasted and finished on the grill. This version goes great with grilled fish and is quite simple. Will try the risotto- that sounds great. Thanks! Thanks for sharing this. It looks incredible and I’ve got some fennel growing in the shade of beans and swiss chard. I know what I will do with it now!! Thanks for letting us know- We are glad it worked and hope you enjoyed it! It looks great in your post! I adore fennel, yet failed miserably when I tried to grow it here in Virginia. The stuff is so darned expensive at WF, I rarely embibe. Have not seen it at the farmer’s market either. Great recipe! Thanks- sorry hard to find in VA…but worth a try if you can get the fennel! oh my – can’t WAIT To try this! i’ve always wondered what to do with fennel, it’s something i love and do not experiment with much… thanks for the share! Thanks for reading- this is a good recipe, we see this fennel preparation more and more in restaurants as well…great flavor / texture- worth making.. I have some fennel in the fridge as we speak. I’ll try this method tonight… great idea! This is one that I’m definitely going to make. Thanks for the kind words and the visit! Most appreciated! We often add fennel to fish with good results…the risotto idea sounds great. The “crunchy” version is best as a side or just a snack (it can bethat good)…. Bought fennel for the first time the other day- now I know what to do with it! thanks. Hope you enjoy it! We just made it again the other night and it was great…and so easy. Sounds interesting. Huge fan of fennel, but i have never tried it this way! Could be up for some fennel this weekend. Yet another sweet treat, rock on! I love caramelized anything – and fennel is already great. Putting the two together is amazing! In addition to a side dish, I sometimes use fennel to spice up my morning routine by making fennel frittatas. You should give it a try! We will- that does sound good (and we love fennel). Thx! I planted fennel in our garden last year, and then had to google a recipe as I didn’t know what to do with it either. I found a fennel and gouda pizza that was so delicious. I plan on planting more fennel this year and would love to try carmelizing it as you suggested. I love fennel. It’s a great dye plant too! Really? Cool. How does that work? I use the tops of the plants about 1 lb. plant to 1 lb. wool ration. I simmer the fennel to extract the color and then strain and re simmer with mordanted wool or yarn. Makes a nice soft green. I purchased fennel as an exploration in veggie tastes, and this recipe was extremely more-ish! So more-ish that I have purchased fennel again today (frying pan is heating as I type), and I hope it’s still available around here in early June so I can serve it to friends. I’m just eating it on nacho chips, and it’s so good! I bought fennel for the first time and I absolutely hated it. Left them in my fridge for two weeks and then I found this recipe. Glad to say I finished up all my fennel and I’ll be heading out to buy more next week! Was just cursing the fennel in my fridge (it was in our csa box this week) now I know what to do with it. I’m going to try adding this to our veggie omelet in the morning! Maybe some artichoke hearts too for the salty balance! Sounds great…hope it works out, it should be good w/ eggs…. I have never eaten fennel before. I like it, almost like fried onions with a difference. can recommend it to anyone. great stuff. That sounds great- hope you enjoy the recipe! Fantastic! Loved the taste of this dish. Similar concept to Brussels sprouts by gweneth Paltrow. Can’t taste the aniseed at all in this. Our household is a big fan of fennel, kids included. While it is in season it would be rare NOT to find a bulb or two in our veggie crisper. We use it in everyithing – diced finely and fried off together with diced onion as a base for tomato pasta sauce, cut up in chunky pieces in casseroles, caramelized as a side dish to meat of fish or sliced finely fresh in salads. We use all of it – the bulb, the stalks and of course the ‘leaves’. It is such a fabulous and versatile vegetable. We use it a lot as well, of ten as a substitute for celery. More flavor and better texture (IMHO). Just got some fennel in my Bountiful Basket and had no idea what to do with it! Looks like this recipe will do just fine! Thanks! Just prepared this recipe today. Never knew what fennel actually tasted like, except for fennel seed that I add to Italian dishes. Bravo! It will become a staple in my diet from now on. tried this one out and we love it. Never had fennel before. now to find a recipe for the stems. Hope you enjoy it. Thanks for the visit! I’m excited to try this… I started participating in Bountiful Baskets last week, so I never know what’s going to be in my basket each week. It’s a great way for me to start trying new fruits and veggies I wouldn’t normally buy. Last week I tried persimmons for the first time, yum! This week I had to figure out what in the world to do with fennel. This recipe seems very doable, and sounds like something I would enjoy! Hope you enjoy the fennel- we love it caramelized but also in soups w/ fish. A great ingredient once you get started with it. One of my favorite vegetables, cooked it many different ways but have yet to find a fennel recipe like this before. This seriously looks fantastic, thank you for sharing! that the snow and wind are some signs you may not cover your Chinese drywall work. Good idea; but don’t use olive oil – the smoking point is too low. The best oil to use is rice bran oil; it has a good, high smoking point, so you can get to higher temperatures and cook more quickly. Olive oil (extra virgin) should be saved for salads, or to flavour food that’s already cooked – it’s not a good oil to cook with, and there’s also the trans-fat issue. Rice bran oil will also give you the best chicken schnitzel you’ll vere taste. Nice idea! Made the pan-grilled fennel into a pasta dish to good effect. Snipped the browned fennel into smaller pieces and tossed it w the following: capers, toasted pignoli, sauteed garlic, lemon zest, lemon juice, ground pepper, red pepper flakes, lots of chopped parsley from the garden. Let that all stew together for a bit, with a little extra EVO, then topped bowls of pasta with the medley. Served with grated Parmeggiano for me, brewers yeast for my vegan husband. Note: already had the pignoli in hand, though read recently in the NYT that they are frequently harvested in an ecologically damaging manner. Will be switching to other nuts for pesto etc rather than the pine nuts. I am so glad to have discovered this! I work at a farm and I have 8 bulbs in my frig right now. I had no idea what to do with them…until now.